Things have died down ever so slightly for Stranger Things in the hiatus between seasons 2 and 3. I mean, I guess that’s pretty normal for such a show, but man was the merchandizing crazy during the Season 2 launch. 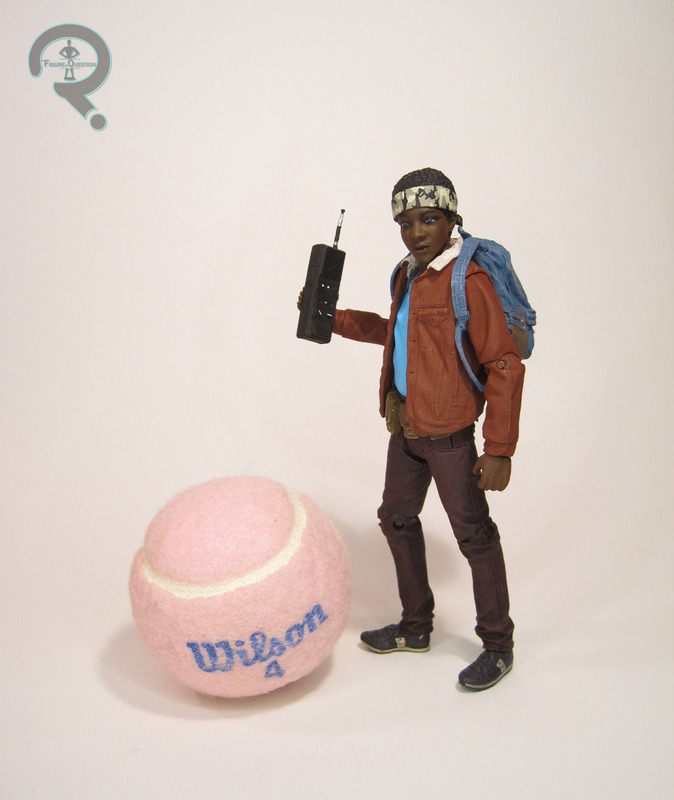 Anyway, while we all wait for Season 3’s arrival, there are still a number of figures out there just ripe for reviewing, including today’s offering, Lucas Sinclair! 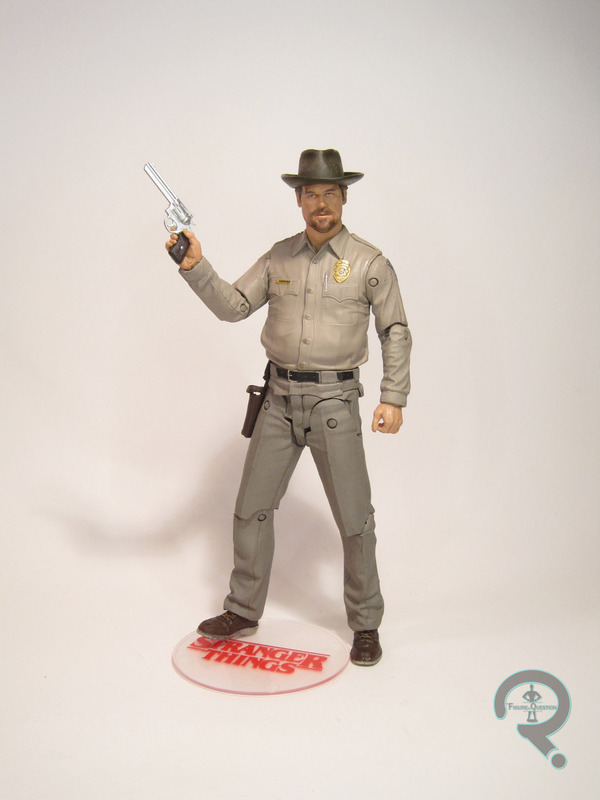 Lucas, alongside Dustin, makes up one half of the second series of McFarlane’s Stranger Things line. Admittedly, it seems a little odd to me that Lucas and Dustin jumped ahead of Mike and Will for the Series 2 line-up. Mike and Will are both far more plot-important, and I do slightly worry with McFarlane’s track record that they may not get made. Time will tell, I suppose. 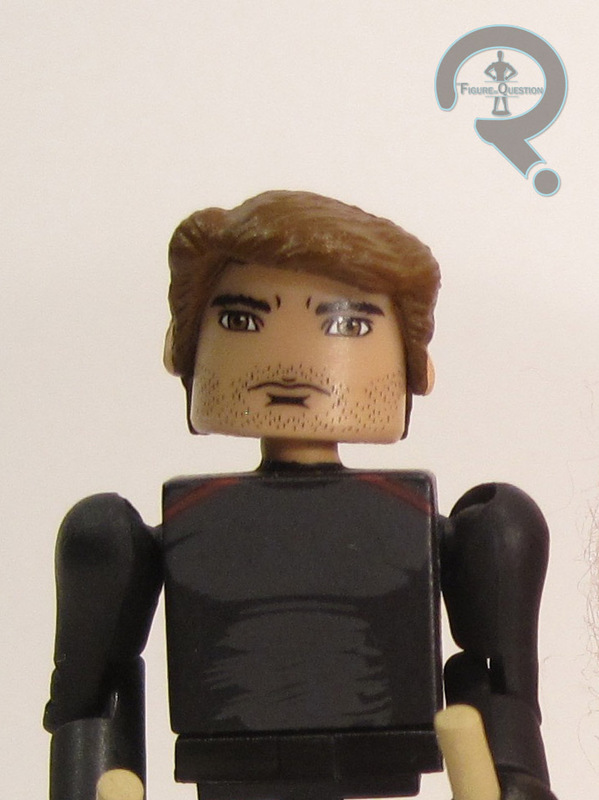 In the mean time, let’s focus on the positive: Lucas figure! Lucas is sporting his Season 1 appearance, camo-headband and all, meaning he matches up with the rest of the figures so far. 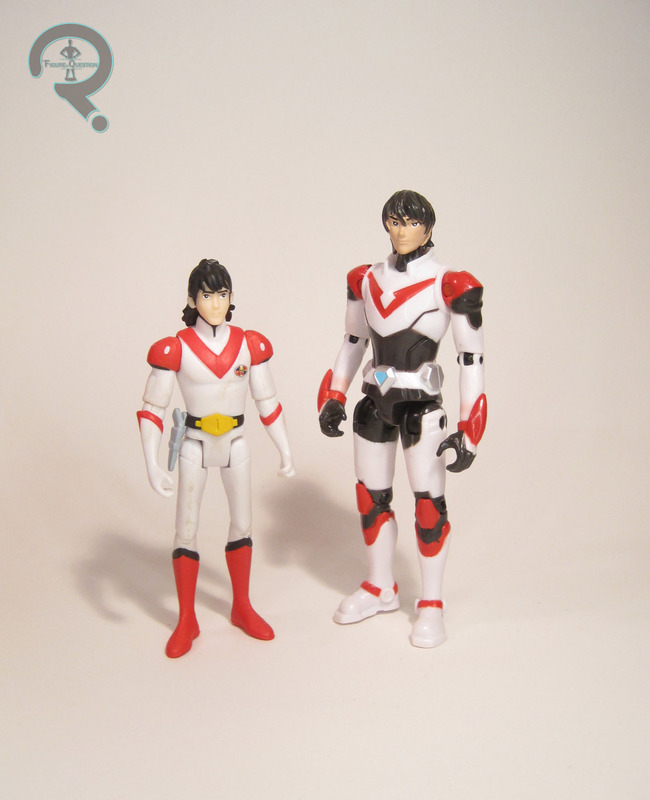 This figure stands 5 3/4 inches tall and he has 24 points of articulation. Lucas’ articulation style is essentially the same as Series 1’s Hopper, but he doesn’t quite suffer from the wonky-looking integration of articulation that Hopper did; it’s much more naturally placed for Lucas. Lucas’s sculpt is definitely a strong one, perhaps the strongest of three figures I have from the line so far. 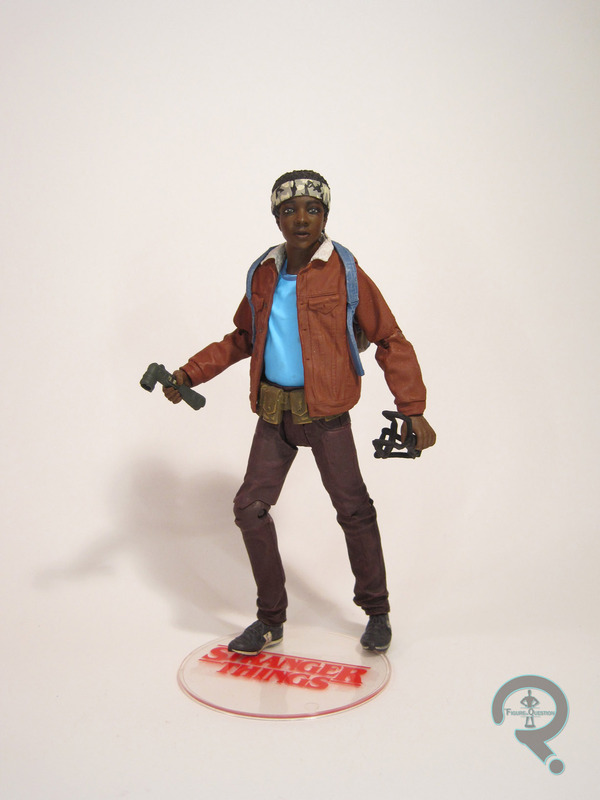 While the likeness on the face isn’t quite as spot-on as I felt Hopper’s was, there’s still definitely a lot of Caleb McLaughlin in there, and I think it’s enough to help clearly identify him. The work on his clothing is definitely very strong, from the corduroy texturing on the pants, to the sharp detailing on the seems of his jacket, as well as the rather natural way the clothes have been sculpted to hang. Lucas’ paintwork is definitely the best I’ve see so far from the line. It’s clean, accurate to the source, and downright eye-catching, which is certainly a nice change of pace after the last two. Lucas is quite nicely accessorized, including his backpack, a flashlight, his slingshot, a radio (with an extra hand for holding it), and a display stand. The backpack is definitely the coolest of the bunch; I really dig the weathering on it. On the opposite end is the slingshot, which is hard for him to hold, unpainted, and nondescript enough that I didn’t know what it was at first. After picking up Eleven and Hopper back in February, I was definitely interested in getting more of these figures, but other lines took precedence, so I kind of fell behind. Lucas was grabbed during TRU’s liquidation process, because why not? And then, like so many of the figures bought during the summer, he just sat unopened for a good few months. He’s actually been on the review schedule three times, and I just kept having to bump him because he hadn’t even been opened yet. I’m actually a little annoyed with myself about that, because he’s a pretty solid figure, and I wish I’d figured that out a bit sooner. Guess I’ll need to be tracking down Dustin now. As far as Netflix original product goes, I think Stranger Things caught a lot of people by surprise. Most caught by surprise? 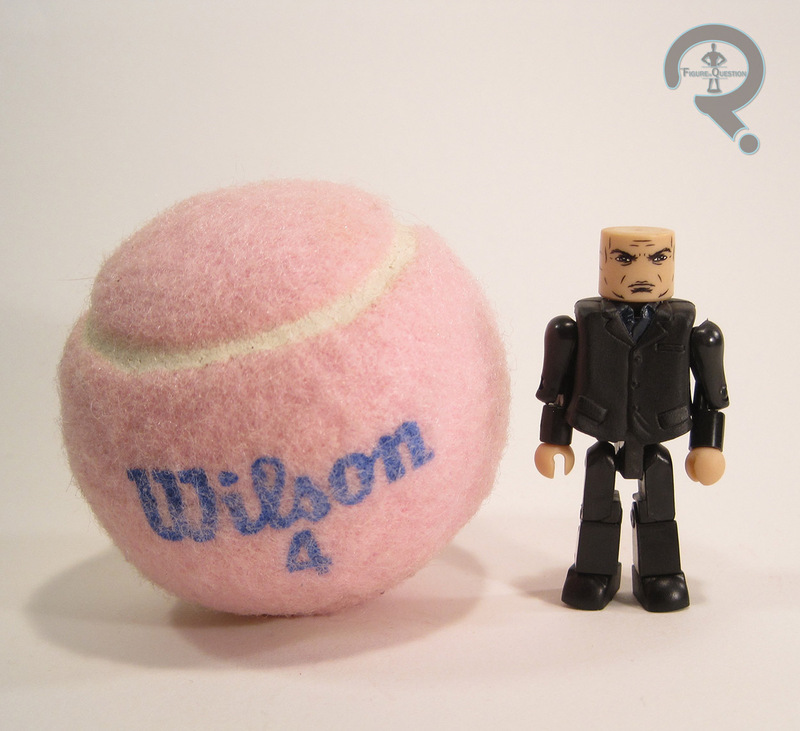 Toy makers, who had no idea that this little online show would gather such a demand for product. 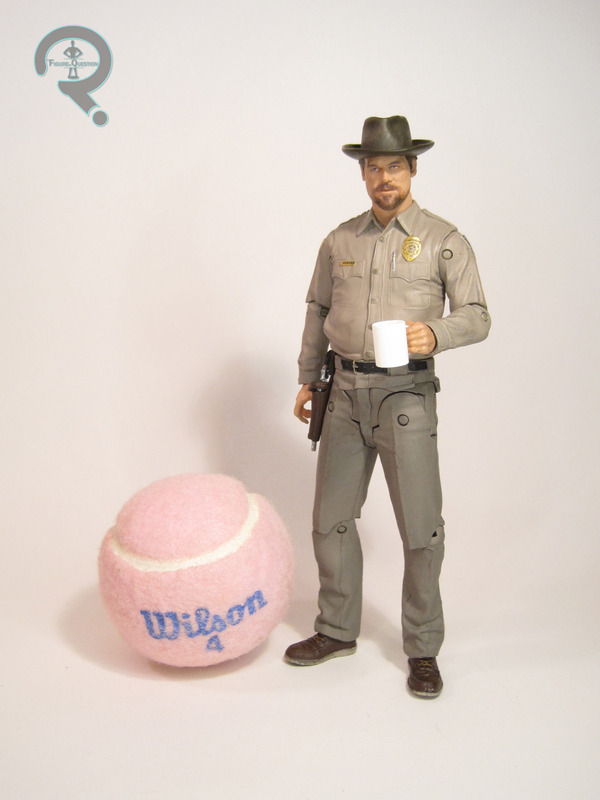 Funko were the first on the scene, by virtue of picking up every license under the sun, but McFarlane Toys has been pretty quick with their follow up. 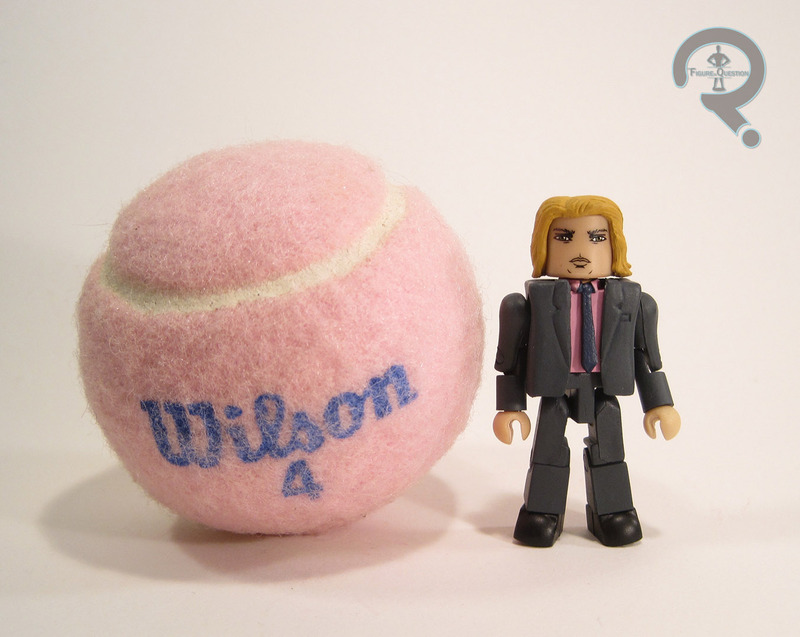 They’re moving at a slightly slower pace than Funko, but producing a slightly higher-end product. 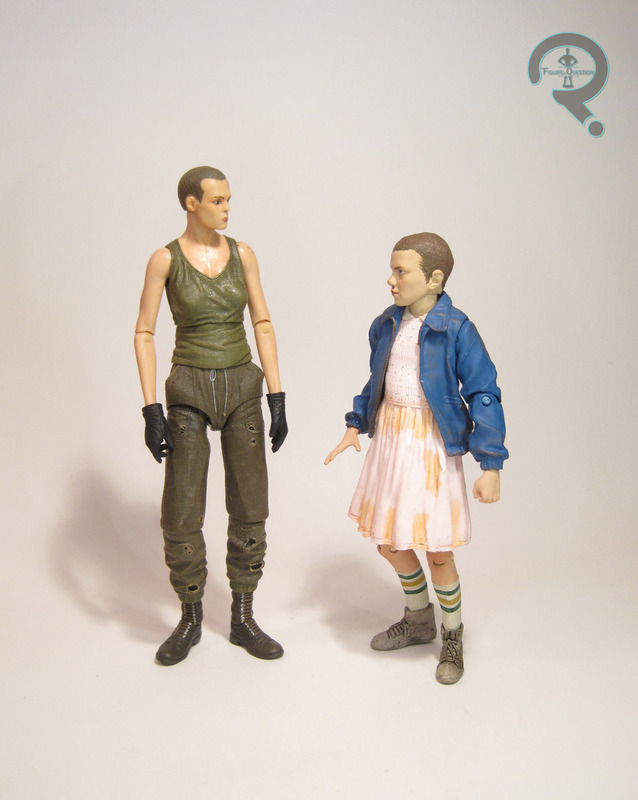 I’ll be taking a look at their first version of central character Eleven today. 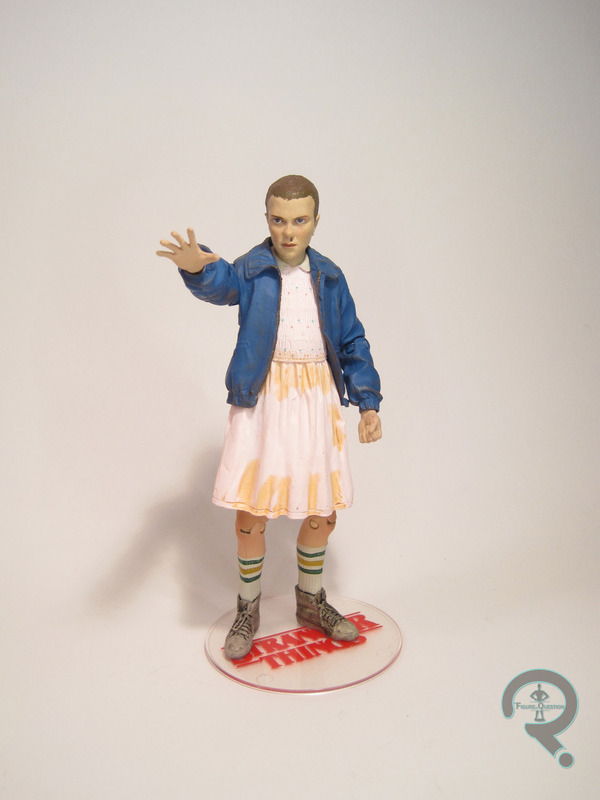 Eleven is one of the two figures (three of you count the deluxe Demogorgon) in the first series of McFarlane’s Stranger Things line. This is a Season 1 Eleven, specifically depicting her after she’s taken in by the boys. The figure stands 5 3/4 inches tall and she has 18 points of articulation. The articulation on Eleven is a bit more restricted than Handsome Jack, mostly in regards to the hips, which are just swivel cuts here. It makes her a little hard to keep standing, but ultimately she’s still pretty mobile. 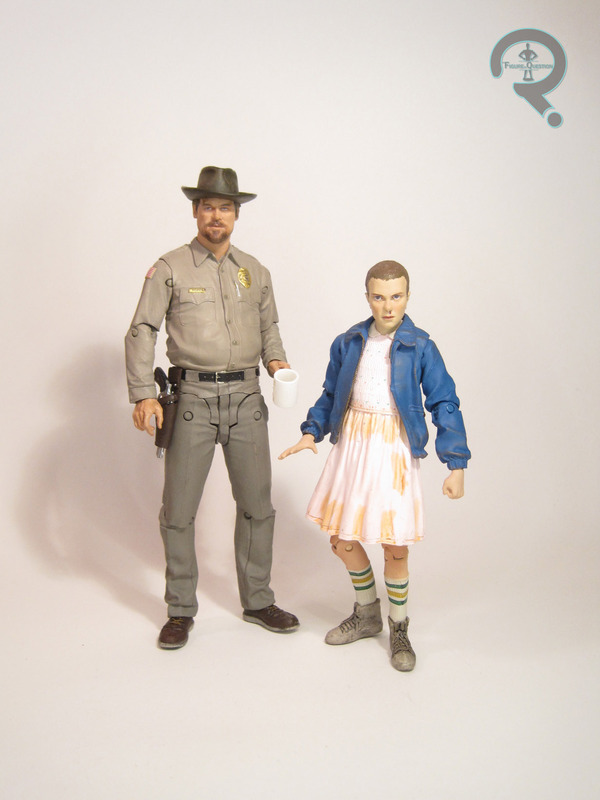 Eleven’s sculpt is generally pretty solid. The body has fairly realistic proportions, and the texture work and depth on her clothing is decent. I particularly like the work on the shoes, right down to the slight disheveled nature of the laces. I think some areas, the skirt of her dress in particular, do end up a touch soft, but it’s not awful. I’d also prefer if said skirt piece had been made from a softer material, as well, since the thick hard plastic sort of looks off. There’s even a clear cut at the waist where the new material could have been swapped in. Her head sports an okay likeness of Millie Bobby Brown, but not quite a spot-on one. There’s just something slightly odd about it. I think her face may be too wide. It certainly looks better from some angles than from others, though, and if you can get the head into a good downward tilted death-glare sort of look, I think the likeness greatly improves. In terms of paintwork, this figure definitely has its plusses and minuses. The face is pretty decent, especially the eyes and mouth, which are pretty lifelike. However, the decision to go for the bloodied nose look seems a little strange, especially if there’s no alternate head or anything. As far as the clothing, the wash on the jacket and the shoes looks good, and adds some necessary wear to them. That said, the same effect doesn’t work so well on the skirt, which just looks like someone smeared spaghetti sauce along the bottom of it. I think a cleaner look for that particular article of clothing probably would have looked better. 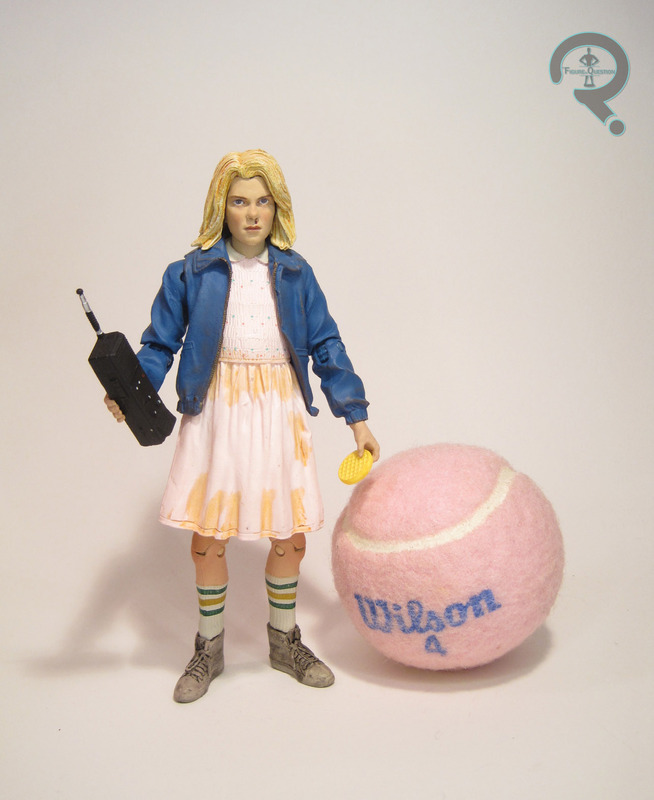 Eleven is packed with a wig, an Eggo waffle, a radio (with an extra hand to hold it), and a display stand. Not a bad assortment of extras at all. The wig sits a lot better than I’d expected it to, though it just makes the issue of the permanent stream of blood from the nose even more prominent. The waffle is fun, but I don’t know that we ever see her with just a single waffle; I think the box would have hold the idea a bit better. The radio’s an important piece, and I’m glad that got included. The stand is also important, since, as noted above, she can have a little difficulty standing on her own. This past Friday saw the release of The Defenders, Marvel’s big team-up series formed out of their four Netflix TV series. It’s an event several years in the making, so it’s pretty cool to see it finally hit. 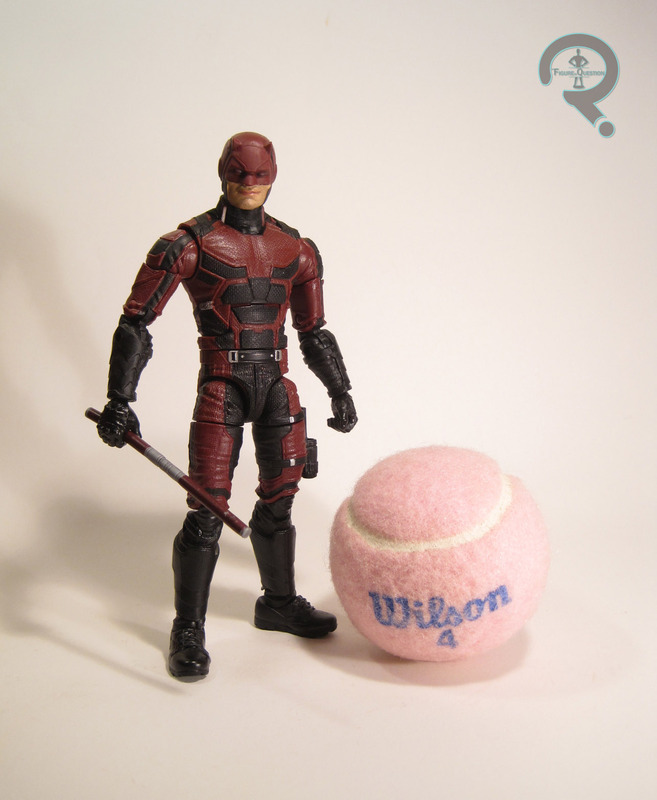 No doubt in an effort to tie-in with the show’s release, Hasbro has just put out their first series of Marvel Legends based around the four shows. 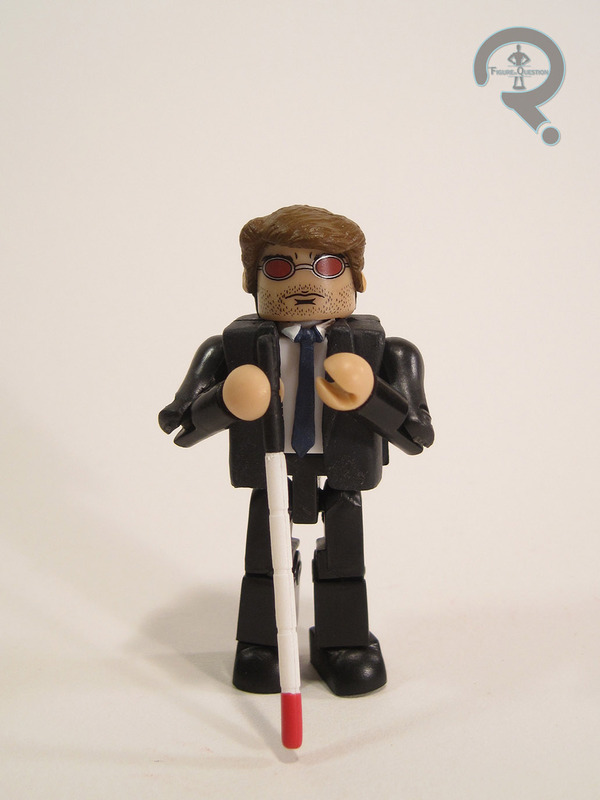 Earlier today, Super Awesome Girlfriend took a look at Punisher from that line, and I’ll be having a look at my personal favorite of the Defenders, Daredevil! 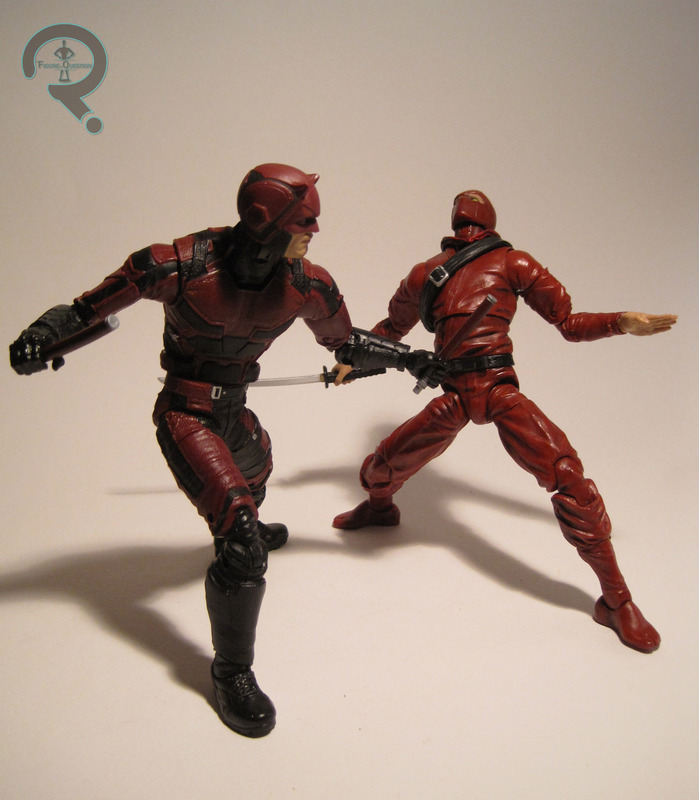 Daredevil is figure 1 in the “Man-Thing Series” of Marvel Legends. The series takes its cues from the “Marvel Knights” banner which has served as the basis of the shows so far. 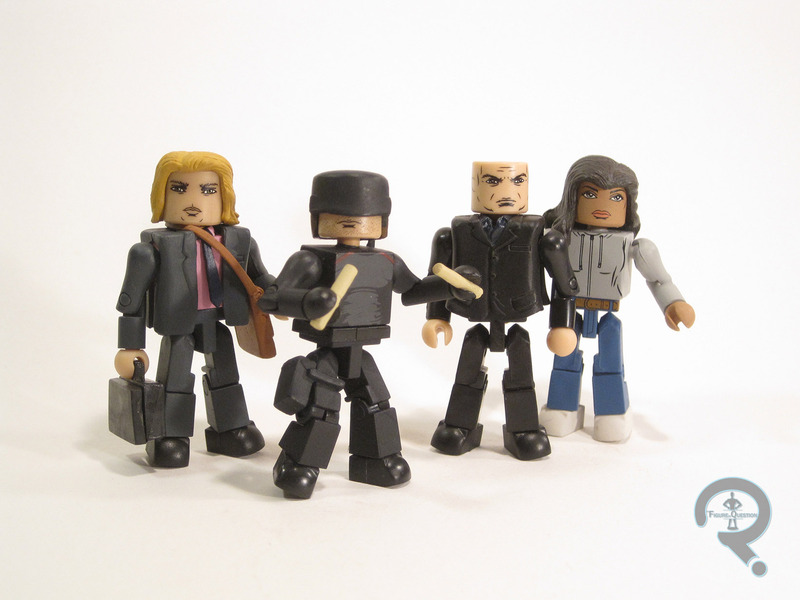 The set’s made up of four show-based figures and two comic-based, with a comic-based Build-A-Figure. Obviously, DD is one of the four show-based. 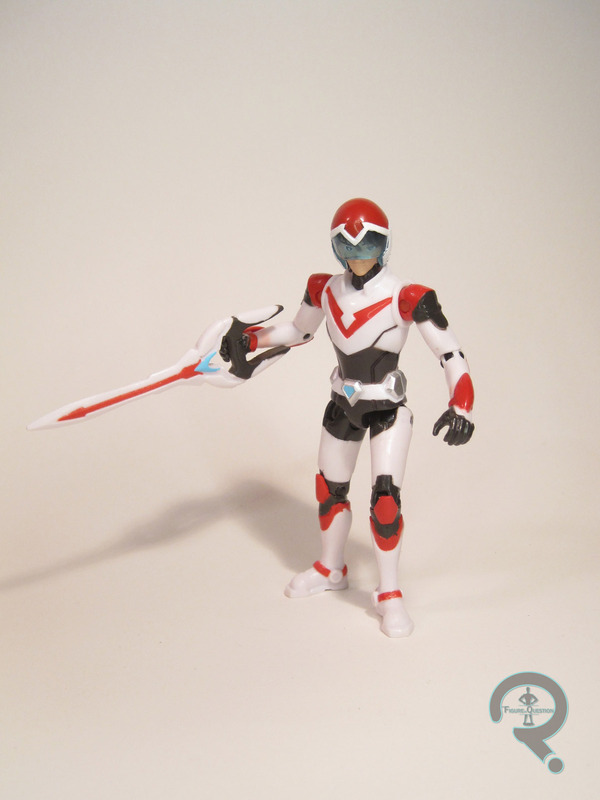 The figure stands a little over 6 1/2 inches tall and he has 32 points of articulation. 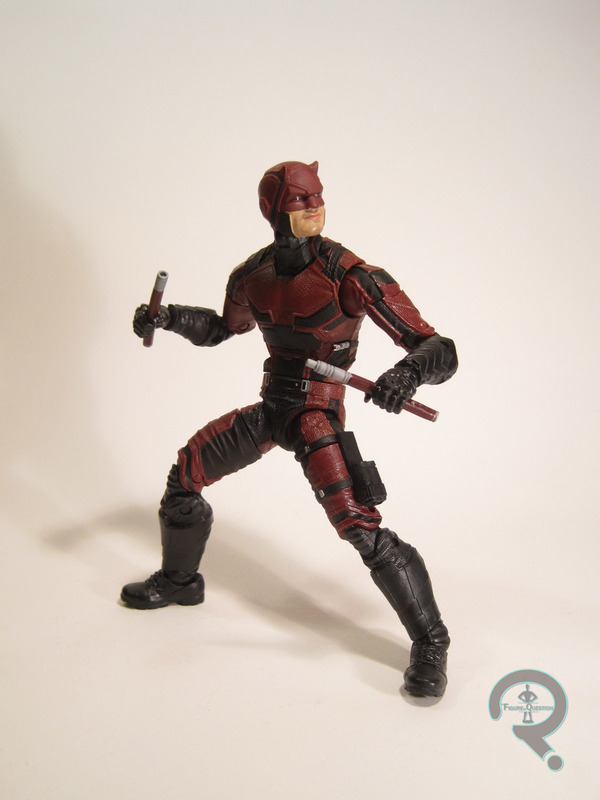 He’s got an all-new sculpt, based on Matt’s costume from the end of Daredevil Season 1/very beginning of Season 2 (the mask is the giveaway; it’s the original, more angular design). The sculpt is 100% new to this figure, though I wouldn’t be shocked to see a lot of it turn up again in some capacity, should Hasbro decide to do a Season 2 version. The sculpt is, surprisingly, a little bit of a mixed bag for me. 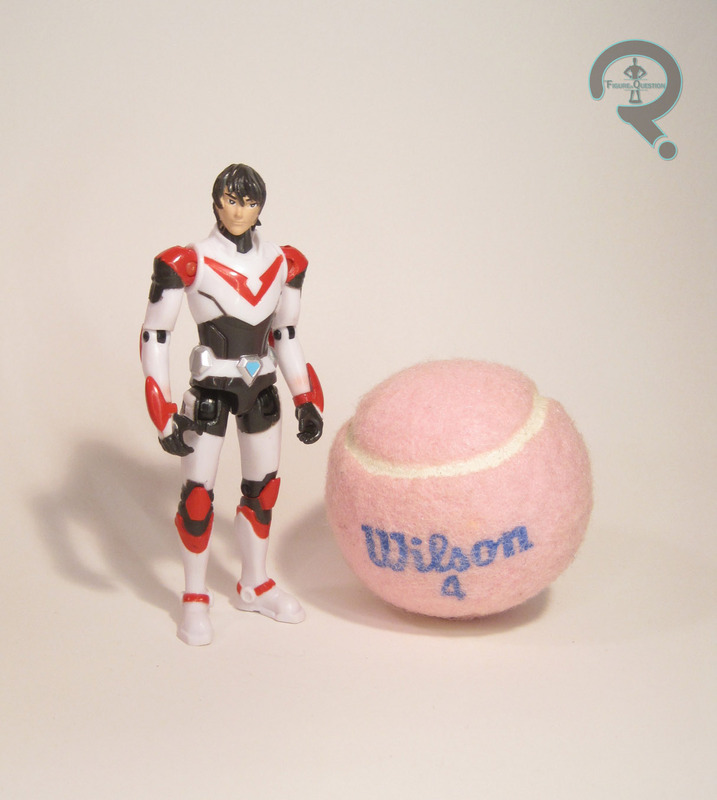 Given Hasbro’s recent track record, I was expecting them to knock this one out of the park, but they haven’t quite managed that. As a whole, I’m happy with the work that’s been done. The surface details are all great. The detail work on the costume is awesome; the texturing is top notch, and the details look to have been lifted right from the on-screen costume. It’s the proportions of the figure that throw things off. My biggest issue is with the shoulders, which just seem too far set out from the rest of the body, giving him this odd sort of tortilla chip thing. They just always seem to be sitting slightly the wrong way. The torso’s also a little flat, but my other main issue is with the head. As with the rest of the body, the surface details are great, and he even has a decent resemblance to Charlie Cox…if Charlie Cox were a bit wider than he is in real life. Not heftier, or fatter; just wider. It honestly looks like the head got slightly squished. Which is a shame, because if it were just a little slimmer, it’d be a spot-on sculpt. As far as the paint work goes, DD is pretty decent overall. The Netflix figures have the same printed faces seen with Ragnarok Loki. For Matt, this is really just limited to the lower half of his face. The printing on mine is actually slightly skewed to the left of his face, which makes him look just a tiny bit off. It’s not terrible, but I did notice it upon close examination. On a figure with more proper placement, I’m sure the details look great, though. The rest of the figure is the traditional paint methods, which are fairly cleanly applied. They did miss applying the black details to the front of his mask, around his eyes. It’s not super awful looking (since the design of the cowl means that part of the mask catches shade naturally), but it does make me wonder if they were maybe working from the Season 2 design for the colors? 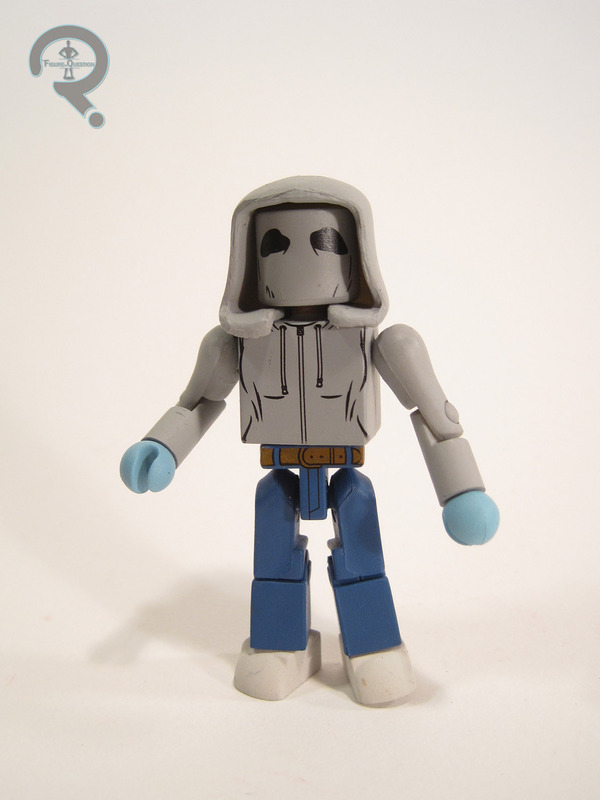 [EDIT: after looking through some images of the costume, it looks like the front of the mask was left unshaded in Season 1, and the black was added at the start of Season 2, making this figure definitively a Season 1 DD] Matt is packed with his signature billy clubs (which are finally a new mold; thank you show accuracy! 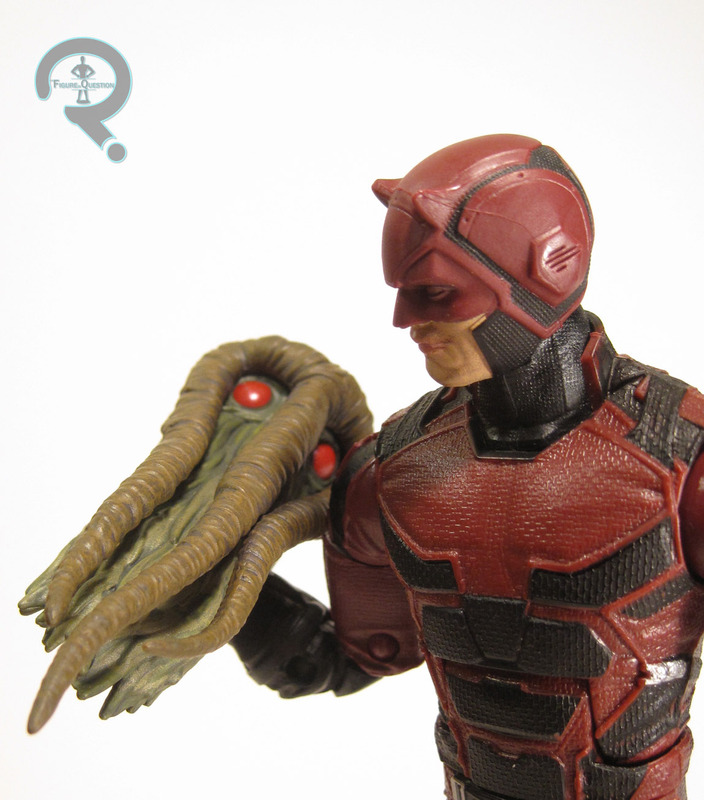 ), as well as a pair of fists, and the head of the BAF Man-Thing. I’m a little surprised by the lack of an extra head, either unmasked or Season 2, but I guess that might have been a bit much for a figure that was 100% new sculpt.